It gives me pleasure to report on another very successful year for the Assore group. The financial results of the group are largely dependent on the level of global economic growth as the majority of commodities produced are used in the production of crude and stainless steel, the consumption of which is intimately related to global capital spend. In addition, group results are significantly affected by US dollar commodity prices and prevailing exchange rates which are risks that cannot be controlled directly. The overall safety performance metrics in the group were positive. Assmang, which is jointly controlled by Assore and ARM, demonstrated continued improvement. We are, however, saddened to report the tragic loss of a colleague due to a work-related incident that occurred on 30 March 2018 at Sakura, in which Assmang has a 54,36% interest. Again we share our deepest condolences with the families and friends of our colleague, and deeply regret this loss. The combined lost-time injury frequency rate (LTIFR) for the Assmang operations has improved from 0,17 for FY17 to 0,13 for FY18. 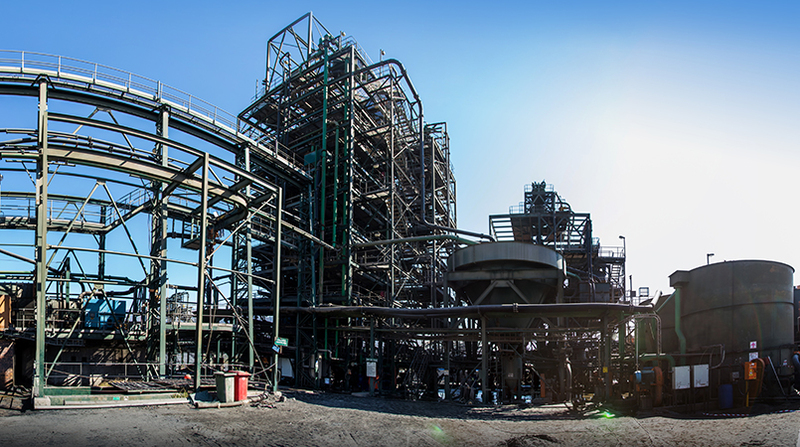 The Cato Ridge and Machadodorp smelting operations completed FY18 without recording a single lost-time injury. Dwarsrivier showed a slight improvement in its LTIFR from 0,20 for FY17 to 0,19 for FY18. The impact of the LTIFR at Assore's other operations resulted in an overall increase from 0,25 for FY17 to 0,27 for FY18. Beeshoek was also the recipient of the best safety performance award for achieving 16 000 fatality-free production shifts. We remain committed to the pursuit of continued, sustainable improvement in our overall safety performance. The group's significant markets are located in the Far East, India, Europe, North America and South Africa. Although the group's sales for iron and manganese products are reasonably diversified, the Chinese market remains the dominant destination for the group's products, especially for chrome ore. Diversification has been achieved through the establishment of long-term supply relationships, both directly and through agents. The group continues to develop other markets using its existing industry knowledge and in anticipation of future market developments. The markets into which the group sells its products were generally stronger during the year in comparison to FY17. 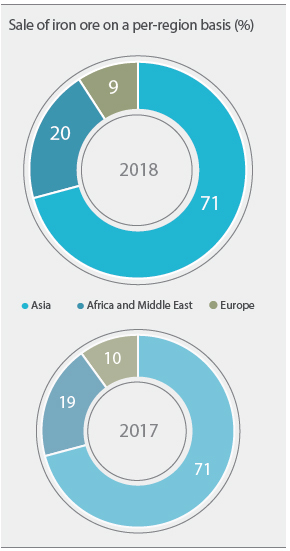 World crude steel production grew by 5% in the 2017 calendar year (CY17) and this growth rate was maintained during the first six months of the 2018 calendar year (CY18). Healthy demand for ores resulted in stable prices for iron ore and an increase in prices for manganese ore. Higher demand for ferrochrome was driven by increased production of stainless steel (up 6% in CY17 over the 2016 calendar year), resulting in strong demand for chrome ore, prices of which were steady over FY18. The tightening of environmental controls in China continues to drive positive demand for higher grade raw materials, as evidenced by higher premiums achieved for "lumpy" grades of iron ore. The group, through its wholly owned subsidiary Ore & Metal, is the sole marketing and distribution agent for all the group’s products, including those of Assmang. * Excludes intra-group sales to alloy plants. The average market price for iron ore was stable over FY18, compared to FY17, at US dollar 69 per ton (62% iron content, "fines" grade, delivered in China), which is indicative of a more stable supply and demand balance compared to FY17. Over half of Assmang's iron ore volume is sold as "lumpy" grade material and the premium this grade attracts varied across FY18, ranging between US dollar 5,14 per ton and US dollar 29,87 per ton. The average "lumpy" premium almost doubled over the same period, to US dollar 13,34 per ton, mostly due to the tightening of environmental controls in China. 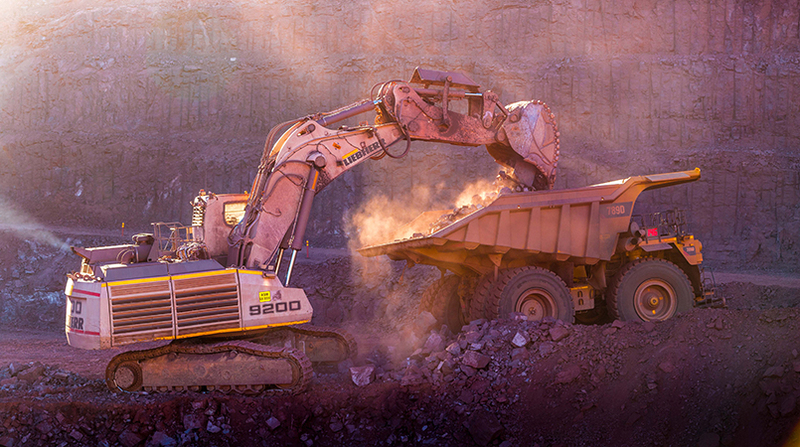 During FY18, Khumani Iron Ore Mine achieved record production of 14,7 million tons and total sales volumes were up by 3% on FY17 to 17,9 million (FY17: 17,3 million) tons. The level of export volumes increased by 2% in comparison to FY17 while local sales volumes increased by 11%. The stable iron ore prices, higher "lumpy" grade premium and increase in sales volumes were, however, not sufficient to counter the effect of the stronger rand/US dollar exchange rate. Earnings from the Iron Ore division reduced in the period, mainly as a result of the firmer rand/US dollar exchange rate, which was 6% firmer over the period. Capital expenditure in Assmang's Iron Ore division amounted to R1,8 billion, of which R302 million was spent on waste-stripping (FY17: R607 million). Other capital was allocated to the procurement of additional mining fleet machinery requirements. The demand for manganese ore remained strong, driven by weaker than expected Chinese domestic manganese ore production and significantly higher Chinese electrolytic manganese metal (EMM) production. The manganese ore market did experience some price volatility due to environmental restrictions which resulted in manganese ore imports into China reaching historical highs. The strong demand and undersupplied Chinese market resulted in an improvement in manganese ore prices, with the average index price for high-grade material (44% grade manganese content), delivered in China (CIF) increasing by 19% to US dollar 6,88 per dry metric ton unit (dmtu), from US dollar 5,77 in FY17. The prices for medium-grade material (37% manganese content) free on board, South Africa (FOB) increasing by 23% to US dollar 5,59 per dry metric ton unit (dmtu), from US dollar 4,56 in FY17. Oversupply in the manganese alloy market started to emerge in the markets outside of China in the second half of FY18 as supply caught up with the increased demand. Although demand from the steel industry remained firm, the increased supply did translate into price weakness. The average index price for the USA and Europe for the FY18 for high-carbon ferromanganese was US dollar 1 434 per metric ton delivered (including duties) (pmt DDP), (FY17: US dollar 1 179 pmt DDP) while the average for medium-carbon ferromanganese for the FY18 was US dollar 1 983 per metric ton delivered (including duties) (FY17: US dollar 1 706 pmt DDP). 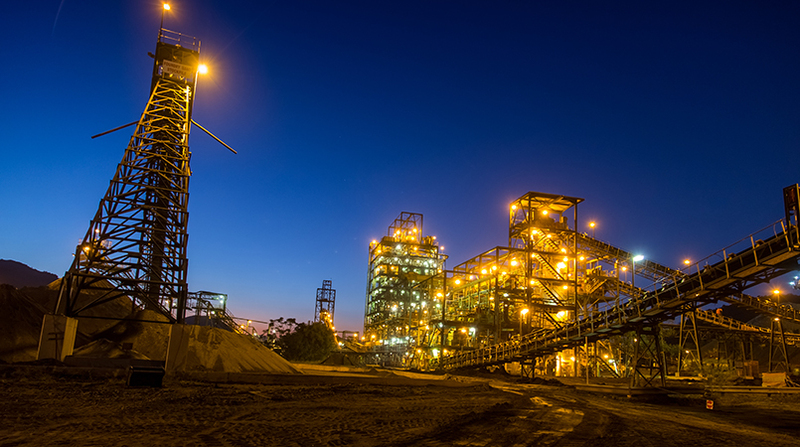 The positive price momentum and increased production of both manganese ore and alloys resulted in significantly increased earnings from the Manganese division. 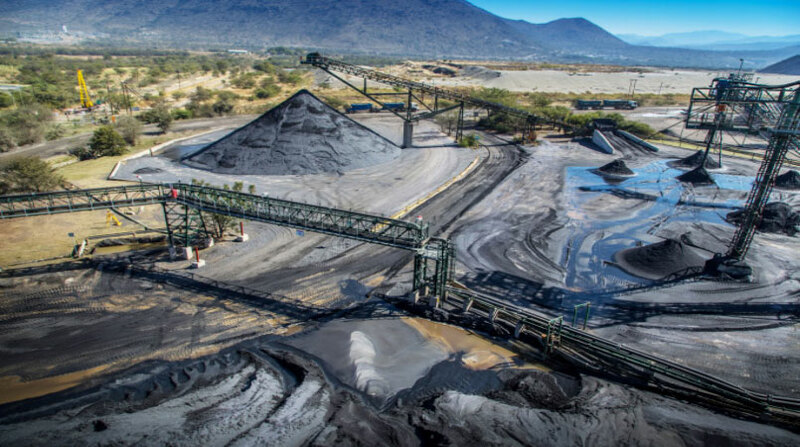 Capital expenditure during the year in Assmang's Manganese division decreased by 19% to R1,3 billion (FY17: R1,6 billion) mainly due to lower capital expenditure incurred for the Black Rock Project, as most of the surface infrastructure improvements were completed and commissioned in FY17. The Black Rock Expansion project is 90% complete, with R6,1 billion being spent to date. 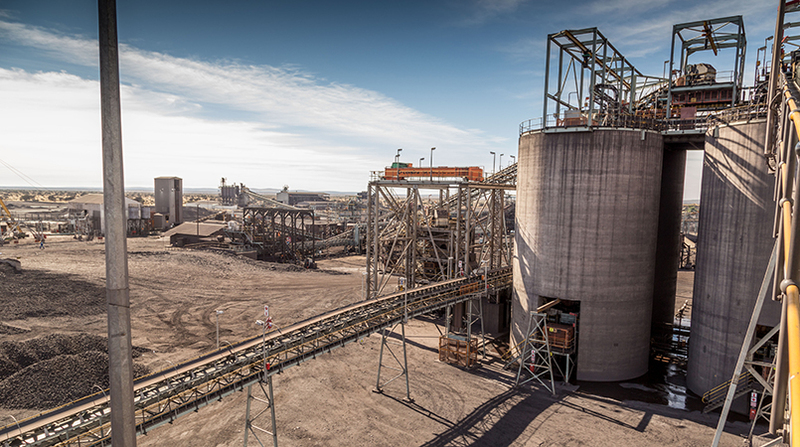 A combination of improved mining and beneficiation efficiencies gave rise to a 16% increase in production compared to FY17, with the mine achieving monthly record production on five occasions during FY18. This production, together with favourable market conditions, enabled the mine to achieve another year of record sales volumes of 1,6 million tons (FY17: 1,3 million tons). The production of stainless steel in China increased by 6% from 24,2 million tons in CY16 to 25,6 million tons in CY17 and world stainless steel production increased by 6% in the same period. The increased level of production of stainless steel supported firm demand and less volatile prices in FY18 compared to FY17. However, the average index market price was down by 28% year-on-year, with an average price for the year of US dollar 224 per ton (44% chrome content material, delivered China), compared to US dollar 310 in FY17. Despite this drop in the benchmark price, realised prices achieved were only 1% lower than the previous year. The group has been mining pyrophyllite since 1937 from a deposit outside Ottosdal, approximately 300 kilometres south-west of Johannesburg, which it trades as Wonderstone. It is volcanic in origin and displays unique heat holding, insulation and pressure-resistant properties. The bulk of the material mined is beneficiated and reworked into components for export to the USA, the United Kingdom and the Far East. These components are utilised in various high-tech industrial applications, including the manufacture of synthetic diamonds and consumable products for the welding and electronics industries, and are sold as specialist ceramic products. The most significant market for Wonderstone products is its use in the manufacture of polycrystalline diamond (PCD) cutters for drilling in the oil and gas well industries. The export market, being the most significant market for Wonderstone, came under pressure due to restructuring at some of the traditional customers, leading to a change in preference for supply materials or outsourcing of the manufacturing processes that required pyrophyllite as an input material. The strengthening of the rand during the trading period further eroded margins on export sales. The domestic market performed in line with expectations and holds further potential, subject to ongoing test and development work that is being done in collaboration with one of Wonderstone's leading clients. Demand for Wonderstone run-of-mine (ROM) material into China remained strong. The Dakot Wear Ceramics joint venture experienced challenging conditions in the ceramic beads market and found entry into the local tile manufacturing business extremely challenging. The business (Wonderstone's 40% share) recorded a R2,1 million loss for the 2018 financial year. A decision was made to divest from this company, effective June 2018 (refer to note 35.2 to the consolidated annual financial statements). Excluding impairment charges imposed in FY18, the attributable profit recorded by the Wonderstone operations amounted to R1,4 million (FY17: R5,1 million profit). Capital expenditure by Wonderstone for the year amounted to R1,2 million (FY17: R5,2 million), most of which was spent on plant and equipment. Group line Projects has improved its BBBEE credentials through a restructuring process by effectively increasing its black ownership to 51%. Its product offering was diversified through strategic alliances in the field of structural maintenance products, in addition to the traditional wear lining products. Demand in the wear lining market continued to be weak with very few major construction projects. Group Line restructured and realigned its marketing efforts and has made inroads into new markets towards the end of the financial year. Financial performance, however, was disappointing, recording a loss of R14,9 million for the year (FY17: R2,7 million loss). Wholly owned subsidiary Ore & Metal Company Limited is responsible for the marketing and shipping of all the group's products, including those produced by Assmang. Strong relationships have been established with customers in the Far East, Europe, North America, South America, Africa and India, and products with a market value of approximately R27,5 billion (2017: R29,7 billion), on which it earns commission, were marketed and distributed in these regions during the year. The company is an established supplier to steel and allied industries worldwide and has operated effectively in these markets for over 80 years. Attributable profit after taxation for the year improved to R409,8 million (FY17: R383,4 million), due mainly to higher sales volumes, higher commodity prices for manganese ore and alloys and stable commodity prices for chrome ore and iron ore. The group holds a 51% share in Minerais U.S. LLC (Minerais), which is a limited liability company registered in the state of New Jersey in the United States and Canada. Minerais is responsible for marketing and sales administration of the group's products in these countries, in particular manganese alloys, and it trades in other commodities related to the steelmaking industry. Minerais' contribution to the group's attributable profit for the year decreased to R65,3 million (FY17: R97,3 million) as a result of more sales being negotiated under distribution agreements, for which the profit margins are lower as the counterparty takes the market risk. As technical adviser to Assmang and other group companies, African Mining and Trust Company Limited provides operational management services to the group's mines and plants. For these services it receives fee income, which is related to turnover in Assmang and to services provided to Dwarsrivier. The impact of increased commissions and management fees received of R24 million, was negated by increased operating and staff costs (R40,0 million), resulting in its attributable net profit after taxation for the year decreasing to R164,4 million (FY17: R181,3 million). Assore holds a 28,9% interest in IronRidge Resources Limited (IronRidge), which is accounted for using the equity method (refer to the consolidated annual financial statements for more detail). IronRidge has a portfolio of gold, lithium, bauxite, titanium and iron ore prospects in Africa and Australia. During the financial year IronRidge acquired 100% ownership of Tekton Minerals providing ownership of its gold exploration portfolio in Chad. It entered into a joint venture with Gail Exploration giving exclusive access to a gold exploration prospect in the Ivory Coast, and acquired highly prospective lithium pegmatite tenure in Ghana adjacent to its existing Ewoyaa lithium prospect on which drilling has commenced. The market value of the group's investment in IronRidge has decreased from GBP24,8 million (R423,0 million) at 30 June 2017 to GBP22,8 million (R410,4 million) at 30 June 2018. The group holds a limited portfolio of listed shares which are selected and held in accordance with long-term investment criteria. In accordance with IFRS, the portfolio is valued in the financial statements at market value. During the year a portion of the portfolio was sold, at a profit of R43,4 million. The market value on the remainder of this portfolio increased and the group recorded a profit of R32,6 million on its revaluation (after allowing for capital gains taxation relief). At 30 June 2018, the market value of the remainder of the portfolio was R262,0 million, based on a cost of R157,8 million. Other income for the group includes interest received of R502 million (2017: R349,3 million) generated on cash in excess of current requirements, which was invested on a short-term basis in the money market, both on variable and fixed rates. The increased amount of interest received is mostly due to elevated average available cash balances and higher rates of interest, which prevailed in part due to fixed rates being higher than the variable rates. I would like to express my sincere appreciation to the group's customers and partners for their support during the year which made these results possible. I would also like to thank my executive team, the management teams at our operations, our dedicated sales and marketing colleagues around the world and all the staff of the Assore group for their support and dedicated respective contributions to this successful year.